Ok, I’m going out on a limb. I hereby declare that Bob Dylan‘s 1984 appearance on Late Night with David Letterman was the greatest musical performance on a TV show…ever. At the time, Dylan’s career was teetering: he’d lost a lot of fans during his late 1970s born-again Christian phase; his previous album, Shot of Love, garnered some of the worst reviews he’d ever received; and his follow-up, Infidels — his first non-gospel record since 1978’s Street Legal, which, itself, divided critics and fans — to many, was either a return to form or a continuation of decline. 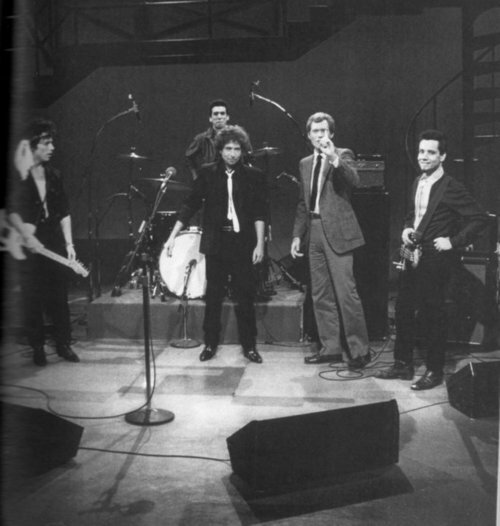 In that charged context, instead of choosing a tight group of session musicians, Dylan appeared on Letterman with a ragged, under-rehearsed L.A.-based Punk band called The Plugz, with a lead guitar player who looked like a Keith Richards impersonator. Numerous times throughout, you can tell that the band is struggling to follow Bob’s lead. Rather than playing versions of License to Kill and Jokerman that listeners were familiar with from the Infidels album, both songs were performed radically different than their studio counterparts. Dylan’s vocal delivery from this period is the stuff of legends. People either hated it or tolerated it, claiming it was due to years of hard living and excess, and his singing on Letterman was characteristically rough, straining to hit the high notes, breaking at times like an adolescent in puberty. On both guitar and harmonica, Dylan was full of blunders. You can see him barely playing the guitar at times, and he starts off his solo on Jokerman with a harmonica in the wrong key, having to step off-camera to get the right one. It all adds up to one glorious thing: Bob Dylan’s propensity for chutzpah; the chutzpah to not play it safe. And the result, is an electrifying, edgy, unpredictable thrill! Just what, in my mind, Rock & Roll is all about. From abandoning traditional folk music and protest songs, to going electric, to going rootsy while everyone else was psychedelic, to using his celebrity as a megaphone for evangelism, Bob has never rested on his laurels. Additionally, while I like all kinds of music, from raw and rough to precision, when I was a kid, aspiring to be a musician, it was the raw and rough that really grabbed me. It was music that was accessible as well as emotionally and intellectually engaging, music, it seemed to me, that I could actually make myself, without having to be a virtuoso. For that, I’m eternally grateful. That’s a powerful kind of inspiration, and Dylan’s Letterman appearance is the quintessence of that inspiration. Next ›Nice Timing, Gorilla Glass. Thanks. Very intersting ! I was one who was a huge fan of the early Dylan and then rather drifted away..
You don’t happen to know who screamed out “Judas!” at the Manchester Free Trade Hall on May 17, 1966?